Is your project extremely complicated? Perfect. How do we re-organise a sprawling site? Is our MVP idea even workable? Will users understand our new product UI? You don’t come to us because you already have the answers. You’re not here just because you need world-class design (although that’s a part of it). You’re here because you’re wrangling a complex project and you need it resolved. Resolved in the right way, to give the right results for your business. Resolved in a way that users are going to love. You know your organisation better than anyone. 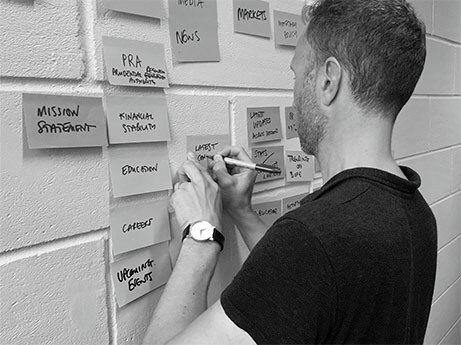 So you’ll be working collaboratively, iteratively and side-by-side with us to blend your deep domain knowledge with our specialist, creative UX design expertise. Your customers will be involved all the way through too. They are the key to challenging and testing every part of the idea. Every project is unique so there isn’t a rigid process. It’s adaptive and modular. But you can expect workshopping and researching. Card sorting and wire-framing. User journey sketching. Digital product design prototyping. Designing and redefining. Testing and re-testing. Then testing again. You can also expect to learn more about how usable your solution really is after publishing. Delivering a delightful user experience means go-live is just another step in the iteration cycle. Got a technical partner or the development covered in-house? Great! As a specialist UX design agency in London, we’re used to (and we love) working with talented partners at home and right across the globe. Many clients also have their own development processes. We’re able to work effectively with Agile, Waterfall or hybrid processes, as well as working iteratively and lean. Slot our UI or UX design into your development cycles as needed. Totally technology agnostic, we’ll work with your chosen platform. We’re happy to create front-end HTML templates for your development team to work with or we can tie them in with your CMS/Custom platform. For MVP products, iOS and Android apps, we work with a tried, tested and trusted network of partners that we’ve collaborated with for many years; some for nearly a decade. We work tirelessly to get every project exactly right and every expert in our team touches it in the process. Take a look at our case studies and independent reviews on Clutch to see the results this attention to detail delivers.